Completing Procedures in Nearly Half the Time! In our on-going commitment to you and your patients, we have pursued advanced research to help you maximize treatment areas while using the same system platform, thereby bringing greater value to your system and your business. Am 3. und 4. September 2015 fand die CoolSculpting University in Washington D.C. statt. 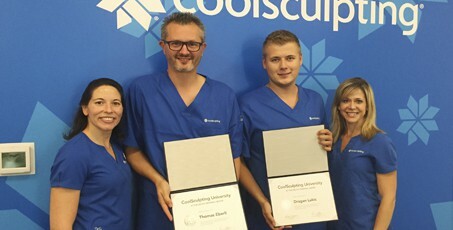 Die CoolSculpting University (auch CSU genannt) ist eine 2-tägige Schulung, die Zeltiq Ihren Kunden und Distributoren anbietet. Der Event findet zurzeit mehrheitlich in den USA statt, aber es sind auch Veranstaltungen in Europa geplant. PLEASANTON, CA–(Marketwired – May 14, 2015) – ZELTIQ® Aesthetics, Inc. (NASDAQ: ZLTQ), a medical technology company focused on developing and commercializing products utilizing its proprietary controlled-cooling technology platform, today announced it recently shipped its 2,000,000thCoolSculpting treatment cycle. Wer friert, nimmt ab – dieses Prinzip lässt sich auch ganz gezielt einsetzen. CoolSculpting heisst eine neue Methode, die Fettdepots um Bauch und Hüfte verschwinden lässt. Eine GlücksPost-Redaktorin hat sie selbst getestet.